Nita Ambani has stepped out from her husband’s shadows years ago. Nita has proven that she can pursue her own businesses and personal advocacies complimenting her husband, Mukesh Ambani’s formidable role in Indian society. Nevertheless, Ms Ambani is quite perplexed that since the construction of her new Mumbai home housed within a 27-storey building, it has gotten more attention than her other projects, which she has given much of herself into all these years. Nita Ambani has built an elite school, the nation’s first Braille newspaper in Hindi in her home country, a Premier League cricket team, and a 400-acre model township that houses 12,000 people and stands adjacent to the world’s largest oil refinery, which she think are far more important than the home they now live in. In a very first interview with Vanity Fair, to be published in June this year, Ms Ambani now dubbed as “corporate India’s first lady,” is willing to reveal the truth behind the construction of her family home that now stands on 400,000-square-foot of land space towering over impoverished Mumbai. "We moved in two months ago, it's a modern home with an Indian heart and it's the only home with have in the world," Ms Ambani tells Vanity Fair. Ms Ambani is willing to debunk the myths and gossips that had long shrouded her home, which has been estimated to cost $1 billion. The Antilia, names after a mythical island, has its own built-in spa, a ballroom, terraced gardens, theatre, guest suites and even a Hindu prayer room. “Getting my temple right was so important,” Ambani, who is known to be spiritual, said in Vanity Fair. She explains that they chose to build the house that way to get more sunlight and was inspired by the theme of lotus and the sun. 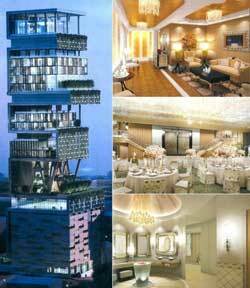 Ms Ambani asks why should be and her family “judged” for the complexity and astute taste built in their Antilia home. Should the Ambanis be praised or scorned for building such a grand scale home?